1stAmender - Have You Been Framed? If you’re a fan of the Perry Mason vintage TV series or have binge-watched old episodes of Law and Order, you’re more than familiar with this adage. When someone is framed, they’ve become the unfortunate subject around which carefully chosen pieces of information combine with false evidence to make them appear guilty of a crime they didn’t commit. In simple terms, being framed means being negatively set up by another in a way that creates the illusion and impression of something that’s just not true. In many of these investigative court room dramas, we discover how framing of the innocent party is often orchestrated by hidden hand personalities. Like magicians versed in magical arts, those who negatively frame another use their wits and skill to bring attention to an innocent party while deflecting attention away from their own nefarious deeds. In the verse above from the Book of Hebrews, we discover a curious proposition I’d like for you to consider and explore. The ancient scripture claims that origin of our worlds came from God who created things out of word and intention. Now if the basis of this idea is true, what might it suggest about the potential for our modern worlds being formed by the thoughts and ideas of “demigods”? Demigods show up in all forms and have done so for centuries. Consider that today’s demigods appear in the form of actors, authors, educators, scientific and medical experts, athletes, news personalities, etc. Some of these individuals’ ideas may be worth our acceptance and adulation; but others may not. Our minds are powerful on a number of levels. We can guide and honor our minds and thought life, thereby guiding and honoring ourselves. But as with human nature, we can also surrender our minds to others through simple conscious slumber or deliberate blind trust. If we accept something of the biblical premise above, perhaps we can begin to understand how our current belief systems and, therefore, our common social matrix, are being formed in the world today. Still doubt the power of framing the world as we know it today? Consider this fascinating Forbes magazine article that highlights the enormous consolidation of our western media outlets. If you’ve ever heard me speak in public, you’ll know how passionate I am about stirring others to authenticity and self-leadership. I want to see people awakened and living happy, starting from the inside. As living individuals, we can choose to reignite the light of wisdom within us and take a more proactive role in “framing” a new and better world. There are great new worlds to be created, if we’re willing to reclaim and “reframe” the thoughts and beliefs of our mind! I invite you to check out my latest podcasts, both of which deal with this topic. 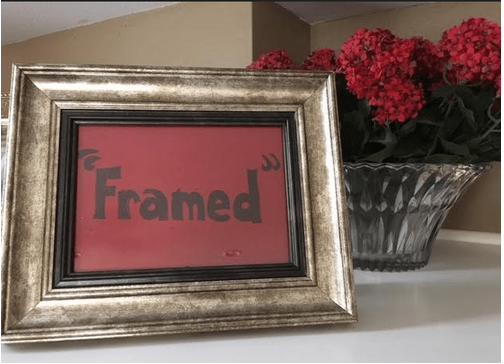 Click here for Episode 139 – Are You Framed? Click here for Episode 141 – Are Your Thoughts Really Yours? Photos, text and podcasts are mine.